You remember that Italy trip that you’ve been planning for ages? You know, the one where you’re at a seaside village staying in a villa perched on a hill that overlooks the water? It’s the trip where you are eating hand made pastas and drinking luscious velvety rich DOCG wines. 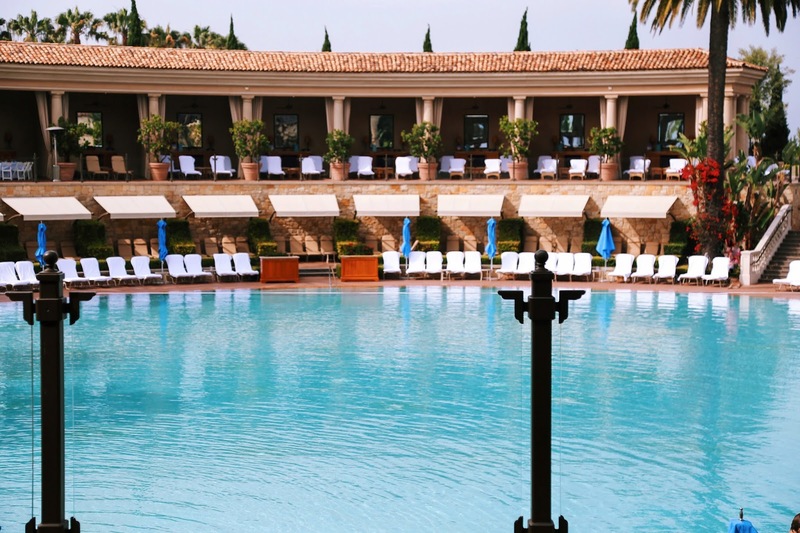 This is the luxurious trip you have been waiting for and you only need to travel about an hour away from LA when you’re visiting The Resort at Pelican Hill in Newport Beach. The Resort at Pelican Hill is one of the world’s finest Five-Star, Five-Diamond destinations offering service and luxury like no other. Sitting on 504 acres with magnificent ocean views, the opulent Italian Renaissance architecture, inspired by Palladio, transports you from California City hustle to seaside Italian village harmony. It’s your escape to a beautiful serene coastal setting where authentic Northern Italian cuisine, luxurious poolside cabanas, award winning spa, and premier golf courses await. This is your ultimate getaway. Over 200 spacious bungalow guest rooms and suites, as well as 128 Villas are available to call this place your new home away from home. They are lavishly appointed with large walk -in showers, deep soaking marble tubs, fire places framed by Italian limestone, and hand-crafted wood beam ceilings to give an intimate residential ambience. Of course one of the best features has to be the private terraces with incredible ocean views. This truly is your well-appointed Italian home for the length of your stay. It has everything you need including modern amenities like MP3 ports, wireless internet, and a superb Bose sound system. Staff members make sure that your Nespresso machine and wet bar stay fully stocked. At night, you can fall asleep peacefully to the glow of the fire place and the comfort of your 500-thread-count sheets on the most comfortable bed you have ever slept in. The Resort features the largest inventory of luxury two-, three- and four-bedroom Villas that are available for daily rental. Dining at The Resort is just as impressive. The resort’s signature restaurant, Andrea Ristorante, offers Tuscan-influenced Northern Italian cuisine with an extensive wine list that is sure to please the casual enthusiast as well as offering you rare vintages. Chef Marco Criscuolo sources seasonal ingredients and creates flavorful classic Northern Italian dishes. Pastas are hand-crafted in a one-of-kind, temperature-controlled “Cucina della Pasta” (pasta room) that stays at a constant temperature. Yes, they’re serious about their pasta and oh, is it so good. The must-order item to start, is the table-side risotto that’s finished in a large wheel of parmigiano-reggiano. Also the off-menu carbonara is one of the best pasta dishes you’ll ever have. Barrel- aged Acquerello risotto with forrest mushrooms prepared table side. Prime filet mignon with roasted heirloom carrots, asparagus, turned potatoes and peppercorn sauce. For a Napa-inspired menu, Pelican Grill features innovative seafood, steak and wood-oven pizzas, and Sunday brunch offers à la carte California cuisine. Chef Luke Turpin creates fresh comforting California classics. For lunch, try the off-menu steak sandwich with grilled onions, gruyere, and arugula. The ahi tuna tartare with Meyer lemon, avocado, cucumber, scallion and sesame oil is the most refreshing start to your lunch. The more casual Coliseum Pool & Grill is a perfect place to sit poolside during brunch and enjoy a delicious lobster scramble and French Press coffee or perhaps a mimosa. The serene and casual ambience is a great way to start your day. The amenities at Pelican Hill are outstanding and simply some of the best that you can find at any word class resort. The Coliseum Pool, inspired by the timeless curves of Rome’s famed landmark, is one of the largest pools in the world. With more than one million hand-cut glass mosaic tiles and 136 feet in diameter, it resembles a precious gem in the midst of the beautiful architecture around you. Treat yourself to a day at the Five-Star Spa, that’s more than a place to enjoy a good massage, helping you restore health and balance through the ultimate personalized care. The golf club, designed by Tom Fazio, boasts 36 holes with stunning ocean panoramas and is consistently ranked among the best in prestigious annual lists. Your Italian seaside getaway is waiting for you. The Resort at Pelican Hill is a one-of-a-kind experience that takes you 6,000 miles away without ever getting on a plane. Italy is a lot closer than you think. Special thanks to The Resort at Pelican Hill for collaborating with Hungry in LA. As always, the content and opinions expressed here are entirely our own.